Bio-Kleen Products, Inc. was founded on and remains dedicated to the fundamental business practices of consistent quality, superior service, and unimpeachable integrity. We develop, manufacture and market specialty high performance cleaning & detailing products for consumers in the United States, Canada, Puerto Rico, Ireland and are continuing to expand. We have been in business and American Made since 1987; and during these years our customers have always been our most important asset. We are committed to tailoring and customizing products, services and resources to meet the diverse needs of our customers. 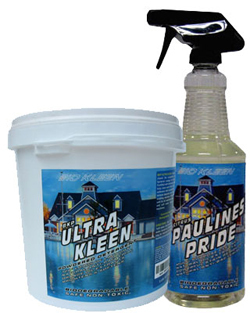 Bio-Kleen Products, Inc. is more than a manufacturer, more than a supplier; we reach to consumers to meet their demands for quality products at competitive prices. Innovation, new product development, custom blended formulations and high quality control standards meet and exceed the demands of the marketplace. Our uniquely diversified range of environmentally friendly products include: Industrial, Marine & RV, Automotive, Motorcycle, Snowmobile, Janitorial and Household cleaners. We offer customers a varied selection of volumes available at value driven prices to meet every need and budget. Throughout our divisions, Bio-Kleen Products, Inc. emphasizes service measured by convenient product availability, on time delivery and guaranteed customer satisfaction. We manufacture and distribute a perfect blend of earth-friendly, safe, non-toxic and biodegradable cleaners that work fast and easy. All of our products are non-aerosol and ozone safe and are not tested on animals; containing no V.O.C. 's (Volatile Organic Compounds) that cause the photochemical reaction of atmospheric oxygen to smog. Our products conform to all USDA (United States Department of Agriculture) guidelines in respect to use in federally inspected meat and poultry facilities.